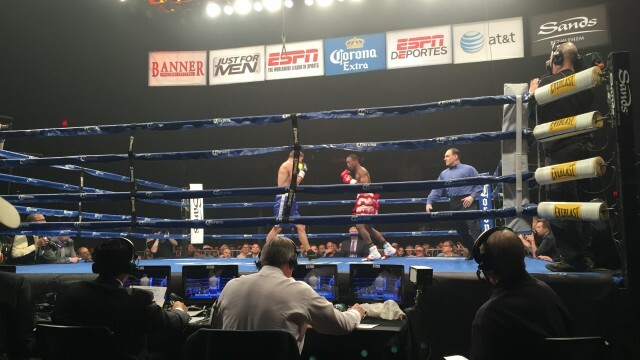 by Joe Latti – Brick City Boxing – The 2015 Boxcino Tournament continues to impress, as this edition took Sands Casino in Bethlehem, PA by storm on Friday, April 10th. The show was promoted by Arthur Pelullo’s Banner Promotions and broadcast live on ESPN’s Friday Night Fights on ESPN2. The semi-finals featured four-eight round bouts in the Jr. Middleweight and Heavyweight divisions, with the winners advancing to the 2015 Boxcino Finals on May 22, 2015 in Corona, CA. The first televised bout of the night featured the favorite to win the heavyweight tournament, Andrey Fedesov taking on Jamaica native Lenroy Thomas. Thomas came out with the intention to prove his critics wrong by landing more clean punches than Fedesov in round one, and even scoring a knockdown one minute into the bout. This seemed to wake Fedesov up as he controlled the second round by throwing and landing more punches than Thomas. This effectiveness continued as Thomas was backed into a corner and Fedesov landed devastating head and body shots, ultimately leading to a knockout 1:01 into round three. Dennis came into this bout off a fourth round TKO over Steve Vukosa, while Cojanu’s entry into the semi-finals was paved by decision victory in a tie-breaker round over Ed Fountain. Action started off slow with Dennis outworking and landing a flurry of punches towards the end of round one. The Bethlehem, PA crowd erupted as Dennis landed a massive left hook to the jaw of Cojanu, a punch which knocked Cojanu out 0:59 into round two and later became featured on ESPN Sportscenter’s “Top 10″ plays of the day. Skorokhod came into this this tournament as a favorite to advance to the finals, while Newark, NJ native Thompson was a late addition and accepted his entry less than a week before the quarter-finals. The early rounds were fairly even with both boxers seeming to concentrate on defense while showing spurts of combinations respectively. Thompson continued his defense in the later rounds with good head movement and jabs, while Skorokhod seemed to slow down a little and concentrated more on landing power punches than protecting himself. After round eight the anticipation grew as there was a possibility of a tie-breaking round. However, the judges made their decision with two of them siding with Thompson (78-74, 77-75) and only one with Skorokhod (78-74), paving the road to the finals for Thompson. Adams entered the ring as a favorite to win this bout and advance to the finals, just as he did last year. Gasparyan showed tremendous heart and gave Simeon Hardy his first loss by unanimous decision to gain entry into this round. Adams used inside fighting with hard, effective punches to gain a TKO victory over Alex Perez in the quarter-finals, and seemed to use the same strategy successfully in this bout. From round three and on, Adams was able to carefully pick his power shots and land most of them effectively. Gasparyan hung in tough for six rounds, but punches to his ear caused severe swelling and possible damage. One punch from Adams to the swollen ear proved to be too much for Gasparyan as he was forced to end the bout :35 into round seven. Tune in to the 2015 Boxcino Finals on May 22, live from Corona, CA on ESPN2 at 9pm ET. Be sure to check out BrickCityBoxing.com for complete coverage of the first round and all tournament coverage. Previous boxing news: Garcia Fools The Judges?